PolishPod101 has one series of audio lessons for beginners and two video series for absolute beginners and beginners. From the perspective of language learning, the audio lessons are terrible. There are 43 lessons, each about 10 minutes long. I reviewed two of them: #43: Buying a Polish SIM Card and #41: Foreign exchange. In the first lesson I reviewed, you learn exactly two Polish phrases. That's it, in 10 minutes of audio! In the second lesson, you learn five. Even for beginners, that is way too little Polish, especially if you've already completed the previous 40 lessons. Most of each lesson is in English. That said, the lessons do contain a lot of useful information for tourists traveling to Poland. In the lesson about buying a SIM card, you learn about the different telephone companies in Poland, what kind of telephone you will need to use a Polish SIM card and where to go to buy one. But you don't learn very much Polish! The videos lessons for absolute beginners are the best material they have for beginners. There are 17 lessons and each is about 3 minutes long. I reviewed two of them: #1: Talking about your daily routine and #17: Expressions that help with the housework. They are vocabulary lessons. First, they give you a subject, verb and object. Then, using these words, they create an example sentence. When each word is introduced, they show you a picture to define it (rather than a translation). The images are marked with a type (ex. "action") and each noun with its gender. The example sentence is illustrated with a short video. At the end of the lesson, they show you the videos and you are prompted to say the example sentences. Each lesson contains a decent amount of vocabulary and very little English (basically only the image labels). I think these are great lessons for absolute beginners! The beginner videos aren't quite as good. There are 25 lessons but only the first 3 are free. Each lesson is 2 to 3 minutes long and covers 5 vocabulary words. I reviewed two lessons about animals. Each animal is introduced with a video and an example sentence describing what they are doing. The sentences are kind of silly and the vocabulary isn't that great (in both amount and usefulness). The audio lessons for advanced learners are quite good! There are 10 lessons, each containing about 3:30 of actual content (not counting the intro/outro in English in each lesson). They are entirely in Polish with guidebook-style topics. They talk about a number of major Polish cities, the Białowieża forest, the Polish mountains, Piast's way and many other interesting attractions. Despite being a guidebook, the lessons are actually quite fun and playful! The only downside is that there are so few of them. I went for a 40-minute walk and listened to them all on my MP3 player! There are a few other resources on PolishPod101, including a dictionary, an alphabet reference and smart phone applications - but all of these are paid features. The only other resources available to free users are the Word of the day service and a list of the most commonly used 2000 words in Polish, given in groups of 100. Paid users can review these words as flashcards. Some of the material on PolishPod101 isn't worth your time - but some of it is rather nice! However, the main downside is the overall lack of content. As a beginner, you could work through the content in 3 to 8 weeks (depending upon how much time you devote to Polish). As a lower-advanced learner, it'll probably only take you 10 days at the most. Have you ever tried PolishPod101? What do you think? Leave a comment below! 12 months after it's launch and still no intermediate content. A lot of phrases for the occasional tourist to learn parrot-style, and some advanced content, but nothing for those of us who want to seriously start learning the language. It's the same story with their GreekPod101. Don't waste your money. Yeah, I definitely see no reason to spend any money there. But in the free advanced content, there is some pretty good stuff (although, very little of it). Unfortunately, there are far fewer people at the advanced level than intermediate! That's really a pity, I've also recently tried PolishPod101, it's so frustrating having these long English introductions, that's really a pity as I've found their (innovativelanguage . com 's) Russian podcasts are really really useful (the Intermediate level). Yeah, unfortunately, since not that many people learn Polish, it can end up being a 2nd class citizen. Languages like Russian, where there are a lot of people learning it, usually have more materials and of a higher quality. another thing, someone should really talk to the polish ministry of culture or whatever, no-one it seems is really helping foreigners learn Polish (neither in Poland nor abroad), a little push could work marvels. 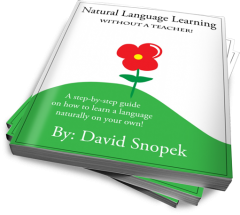 in my opinon, the languagepod101.com series is worth it if you are buying the first language in the series. Japanesepod is definitely worth it, there are lots of lessons and you can skip the audio and just do the lessons (which are only available if you pay, which is what I have done). As for the rest, I'd wait 2 to 4 years before buying the new packages like Portuguese or even Indonesian. Would be great to get some feedback from those that have bought the other language packages. BTW, I just took a look at your blog. It looks very interesting! Chinese is also a language I would like to learn someday. (Honestly, I'd love to learn every language but there is only so much time in the day.) Anyway, I've subscribed and I look forward to reading more of your articles! I wrote them 3 times over a period of 3 months asking about their services. Never got a response to any of them. It seems like the website was set up to run itself, no customer service and no indications that they have intentions of expanding their lessons. Compared to a company like ChinesePod/SpanishPod it leaves a lot to be desired. Their content is OK, nothing special - although the word of the day is nice. You will however get sick of the two or three e-mails every day promoting 'offers' on paid courses.